An outstanding tormented lead performance and an unsettling atmosphere. Pretentious, as in - pretends to be something it is not. If Ramsay keeps making films as intense and gorgeous as this and We Need To Talk About Kevin, she is going to become one of my all time favorites. A trip through the mind of someone with extreme trauma, visually and emotionally haunting. Lynne Ramsay channels a bit of Nicolas Winding Refn here, but what begins with the quirky-but-focused atmosphere of Drive ends with the OTT oddness of Only God Forgives - as a taut, engrossing revenge thriller gives way to a weird confusing mess that eventually dribbles away without any proper conclusion. I'd been quite enjoying this midway through - considering a rewatch if necessary - but even with questions remaining, the lack of any real resolution to the story makes that prospect unlikely. The only thing keeping me from giving this a 100 is the dizzying flashbacks but even those had a purpose. Top to bottom I was completely impressed with this incredibly intense 90 minutes. Everything. I really liked Ramsay's work with We Need to Talk About Kevin, and I was not disappointed here. There is very little development in the traditional sense, it has one story to tell and everything else is nuance as to detail. It works very well for the most part. Phoenix is impressive in a role that is mostly internalized. Great title. Very threadbare plot that suddenly turned inexplicable. Well acted by Phoenix. I personally don't care for films that use the invincible warrior vet trope. Some good fight sequences but you never really felt in danger. Fav scene: fight scene cutting between distant cameras. I thought this was going to be another slow-paced, sleepy small-budget film, but man, something clicks after a half hour. It is a film about violence, grief, and trauma, among other things. The plot doesn't spell things out for the viewer, so you have to rely on the visual cues. It starts off relatively slow, but the visuals are impressive, and by the end it becomes highly engaging. 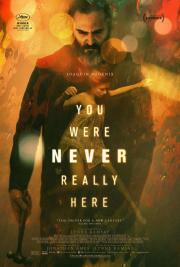 Joaquin Phoenix is a force to be reckoned with, as his performance is definitely the highlight. The story could have been a little more meaty, but I don't think that's the kind of movie Ramsay/Ames wanted to make. Ultimately the audience wins when the creators vision comes to fruition. Style over substance would be a good summary for this one. Too stylistic for its own good. Of course Phoenix is amazing as always but it is hard to stay connected throughout. Will need to rewatch this. At this point it seems to be re-treading a lot of Taxi Driver's steps but less effectively. Gritty, brutal and straight to the point. Ramsay wastes no time progressing the story and showing us the bare, honest and cynical details of the intriguing glimpse of the life of a veteran turned vigilante, sparing neither time, nor poignancy in getting a sound message through. The one criticism I have would be of the lack of graphic details in portraying the action sequences - they are brutal as they are, but felt off key. Phoenix is amazing as usual. I don't know how to review this film. The directing is very interesting, with some spectacularly poignant scenes, but overall the story isn't incredibly enthralling, neither is Phoenix's performance. Neither are boring either, which is why I have the dilemma. This is film is mostly just alright, it's ultimately pretty simple. Nothing remarkable. I probably wouldn't watch it a second time. *spoilers* Echoes of Schrader abound (and TAXI DRIVER specifically); Ramsay is also unafraid to do an explicit tip of the hat to Hitchcock (a dead mother and the framed picture of a bird). The back-story we get for Phoenix's character is so ambiguous and vague; it may have been more effective to allow the audience to completely fill in the blanks ala DRIVE. Phoenix's one-man-show is definitely impressive, and Ramsay indulges in some neat, unexpectedly touching moments (I'VE NEVER BEEN TO ME). Ramsay somehow finds a way to plug vigilante thriller elements into a rich character piece about mental illness and empathy that actually works. She builds a world drenched in transparent corruption and cartoonish evil not too unlike our own, and tells us that the only way we can attempt to deal with it is finding kindness and understanding on an individual level. It's got emotional beats that get the details of depression right, and it has such a satisfying sense of ambiguity that is so rare.